clients, local authorities, industry or private individuals who want to see the price of water being controlled (investment and running costs). This means that, in the cases where plants are designed to operate close to their limits, there is little room to manoeuvre between the standard that constantly applies and the capability of the process that has been installed. Therefore, the plant must be properly operated. Consequently, this means that any discrepancy or malfunction must be detected immediately so that either the set points, or equipment operation, or….. can be rectified or adjusted in real-time. Furthermore, the operator must organise matters so that he optimises his resources and keep a flexible staff: operating units, undertaking first level maintenance … and no longer waiting around in a control centre. Information, alarms, overview of the plant or unit status must reach operators wherever they are. 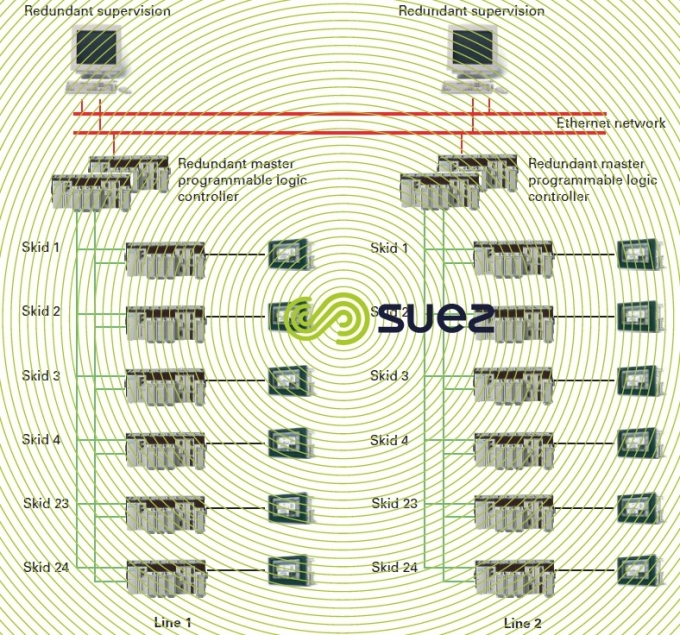 please refer to figure 2 for the icons used in the SCC architecture diagrams. The following provides eight examples of the architecture recommended by SUEZ for drinking water, wastewater or sludge treatment units. sequential filter management, especially covering cycles of 24 hours or longer (approximately 30-minute washing time). a large number of blocks (some fifty in Moscow – figure 4) that regularly become unavailable through the periodic need for thorough backwashing or even chemical rinses. These developments have been reflected in the two architecture illustrations described below. This plant is already heavily automated, comprising of automatically controlled Aquazur filter adjustment and filter battery management. The new technologies offered, Pulsator clarifiers and filters, allow the operator to run his plant manually in a crippled mode. Some operations do benefit from simple automated controls in order to facilitate the operator’s tasks, e.g. using the raw water flow rate to control pH or coagulation-flocculation reagents. Filter washing is fully automated and the following priorities will initiate filter washes: maximum filter fouling, cycle duration, hand operator. The drinking water plant is, therefore, often the place where the operator monitors the entire system, including its pumping stations. Consequently, it is connected to telesurveillance systems via a switched telephone network. 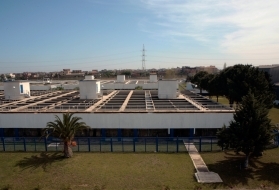 The architecture of ultrafiltration plants using Aquasource® blocks with Ultrazurs follows the plant’s functional breakdown. 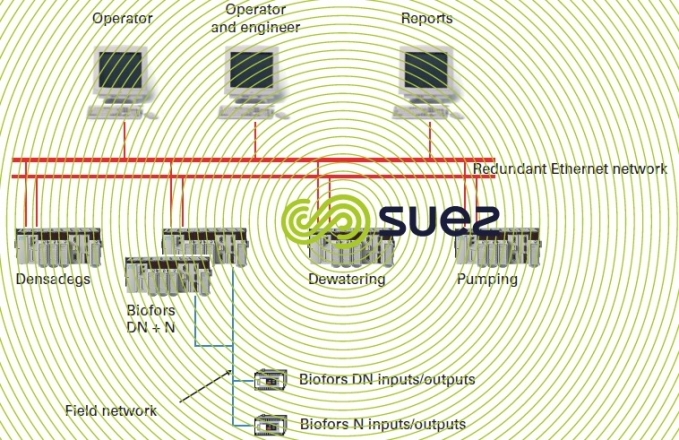 For each ultrafiltration block (48 in all), SUEZ has included a programmable logic controller and a man-machine interface (IHM). This solution allows equipment mounted on the skid to be commanded via the programmable logic controller, when maintenance operations are being carried out. Manually controlled operations outside the programmable logic controller are prohibited as they could result in membrane damage. Without the programmable logic controller, the operator would be unable to run the skid or the plant. The master programmable logic controller responsible for skid management, also co-ordinates the whole: feed, wash authorisation… It plays a crucial role and the installation of a Warm stand-by or Hot stand-by redundant programmable logic controller solution is essential (please refer to the definition of a redundant programmable logic controller). In this type of plant, the operator no longer sees the water as it progresses through the treatment system. Therefore, it is absolutely essential that he has access to real time data in order to run the plant. Consequently, he needs a reliable and sturdy control-regulation system [SCC]. In order to secure this aspect, SUEZ has developed, alongside an approach intended to standardise these skids, standardisation of the software used with skid and master programmable logic controllers. This approach has led to reduced construction costs while providing the operator with an industrially proven and reliable tool. This approach has also produced more functionality for the operator than software that would have been developed specifically for the plant in question. This standardisation is based on a functional breakdown illustrated by figure 5. Therefore, the software is broken down into elementary process sub-functions. As in IT applications, this allows us to produce simpler and better defined functions. Operating instructions and a functional analysis are produced for each function. Each function is tested individually and then as it interacts with all the other functions. This approach enables us to produce programmable logic controller and supervision software without being affected by delivery limitations imposed by contracts and to do so in a more meticulous manner. 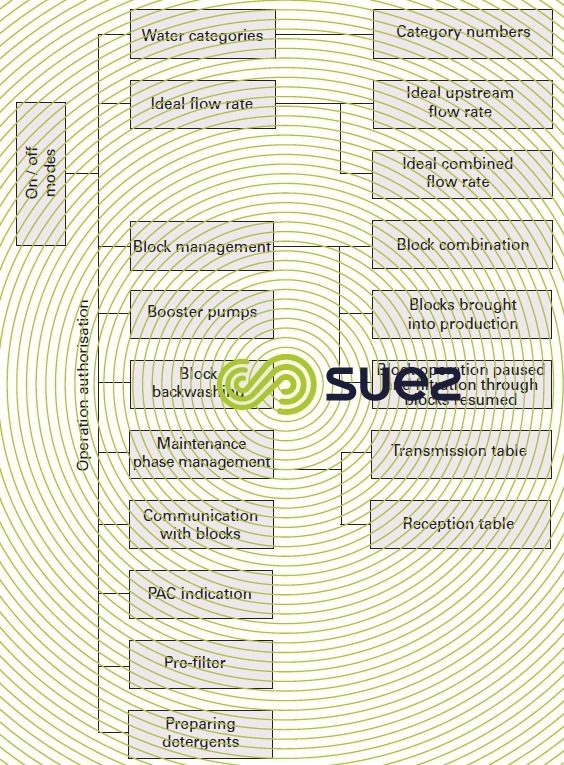 In the case of each function shown in the diagram by a rectangle, SUEZ has developed a function block as defined by the IEC 1131-3 standard. 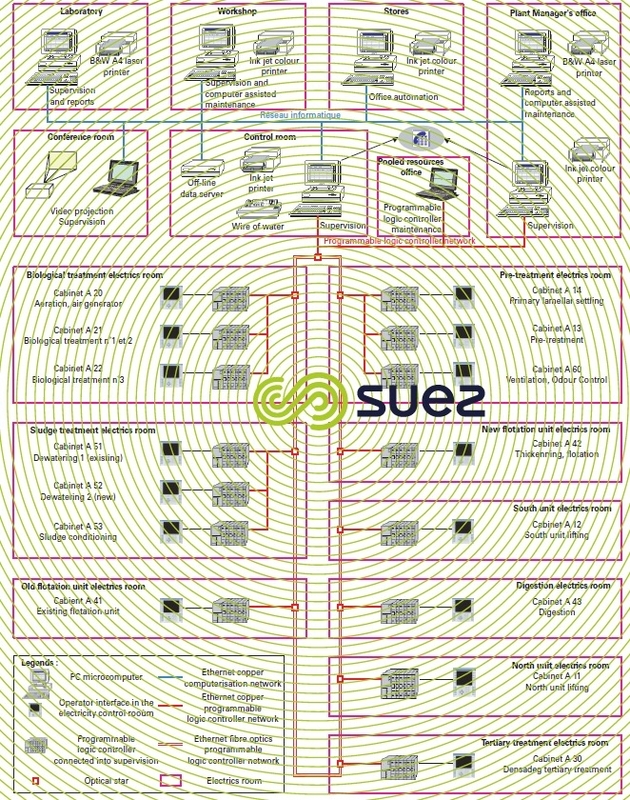 Once this development had been completed, SUEZ was able to configure, and no longer to program, these elementary functions. This elementary function configuration is undertaken according to plant operating modes (e.g. dead-end or tangential) and to process criteria and no longer on the basis of criteria specific to automated control specialists. This structured approach calls for an exchange between automated control specialists and experts, the breakdown emerging from a function-by-function analysis of the process. We no longer refer to programmable logic controller tasks and even less to words, bits…. The result is a standard program for the block programmable logic controller that ‘talks’ to the master programmable logic controller. Thus, for each individual project, we can incorporate any improvement made to the process or its controlregulation system and achieve increasingly reliable programmable logic controller software. We have moved on from high retention time (24 hours for low loading, 6 hours for high loading) activated sludge residence time plants where reactions tend to be based on sludge age (1 to 10 days), to systems based on biofilters that fulfil a number of purposes (C, N, DN…) and, therefore, to different processes, to cycles that vary from 10 to 48 hours but, above all, that require a great many operations during that cycle in order to adjust process parameters such as the number of filters needed, aeration rate... to the instant pollution flow rates to be processed (actual water retention time in the biofilter being limited to 5-15 minutes). With this type of plant, the control-regulation system manages a few operating sequences and, more importantly, warns the operator in the event of a malfunction, either in the control centre (supervision), or on standby duty. The operator can always run his equipment manually. There is no danger that the process will be affected or that the equipment will be damaged: because processes can cope with a shutdown lasting a few hours and when equipment is started up or shut down, this is little effect on the plant’s operation. Problems will arise in connection with the maintenance of either a cabinet/programmable logic controller, or of a man-machine interface because when this type of equipment is shut down, it must not affect the satisfactory operation of several units/structures. Therefore, programmable logic controller and man-machine interfaces must be disposed according to unit/structure and not to geographical location in order to reduce wiring. 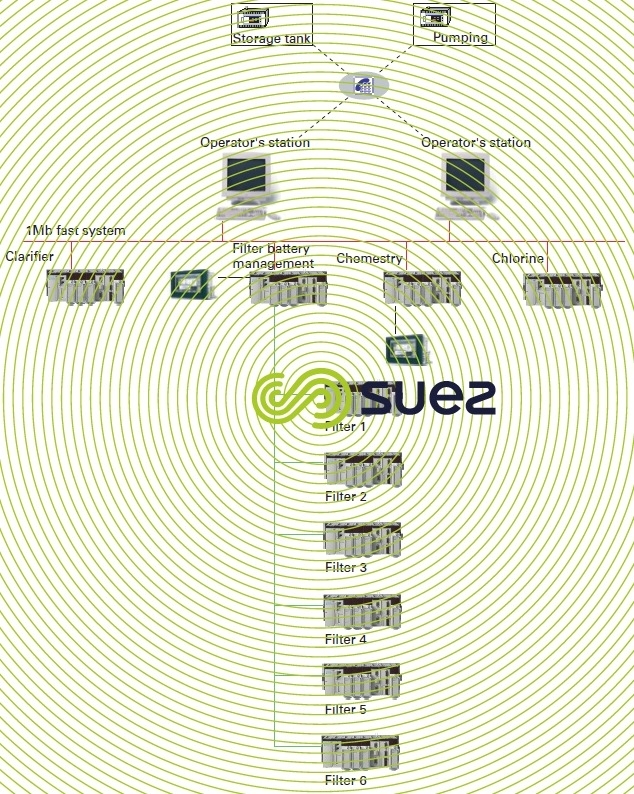 This is illustrated by the architecture used at the Tours (France) plant (figure 6) where the most sophisticated functions tend to involve SCC exchanges with supervision – computer assisted maintenance [MAO in French] – laboratory systems. These plants that often comprise elaborate sludge processing (drying, incineration …) and biofilters can usually be found in urban or sensitive locations. Problems they create for the environment must, therefore, be strictly limited. Additionally, these plants are more often than not covered over, ventilated and subject to odour control. If the ventilation system stops, this can gradually induce H2S levels higher than those allowing operators to work in these areas. Therefore, any work required must be carried out with all due haste. 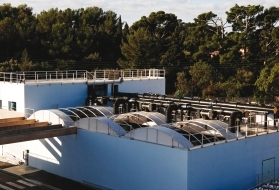 These plants are designed to operate with variable pollution levels or throughputs and the control-regulation system occasionally has to switch the unit from one configuration (for instance with filters in series 2 by 2 or 3 by 3) to a different configuration (where all the filters are operating in parallel) to ensure that the plant can cope with an extremely high hydraulic overload. Therefore, the management sequences applicable to these biofilters are very complex, especially in view of the number of variables to be processed. or a redundant programmable logic controller with valves directly connected to a field network and man-machine interfaces distributed throughout the plant (see solution 3 – figure 9). many programmable logic controllers are installed and maintenance is expensive. simplified wiring between valves and the programmable logic controller. complicated master programmable logic controller software. 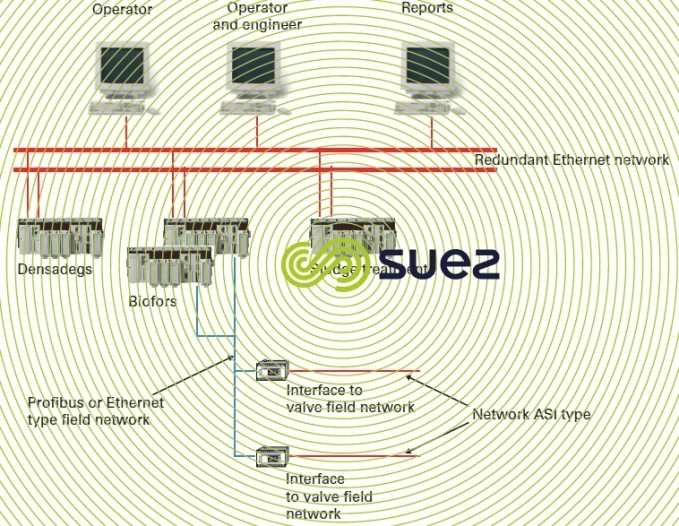 wiring simplified by using the site network. This third solution only has one drawback: the operators need to have control of the site networks. Each case has to be decided on merit. Nevertheless, we tend to recommend the second or third solution. Processes also move from mechanical dewatering systems where there are few available control parameters to thermal processes where the process itself, or the system safeguarding men and equipment requires reaction times of less than one millisecond. The stringent nature of flue gas discharge standards requires systems to operate at their design limits and the need for Control-Regulation systems that rapidly detect any discrepancy. Modern centrifuges require a man-machine interface for ease of testing and adjustment. However, overriding controls will be restricted to start/stop and washing sequences. The machine itself, without a programmable logic controller but with a specific controller, performs the dewatering function (differential speed adjustment, see high pressure centrifuges). Thermal processes, furnace and dryer are instument laden. Some dryers require programmable logic controller programs with rapid emergency shutdown sequences including procedures to avoid any fires starting up. Therefore the programmable logic controller programs are complicated and difficult to use. 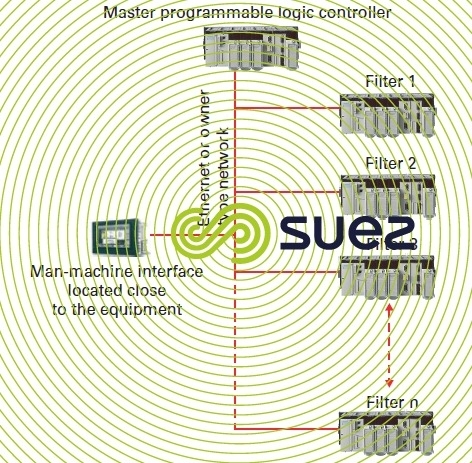 With a view to making these programmable logic controller programs reliable, SUEZ has developed, in the same way as had been done for ultrafiltration, certain specific modules. However, thermal processes are too variable to be entirely standardised. Therefore, we shall restrict ourselves to defining a few function blocks, the remainder of the program being designed specifically for each individual project.